Preeti is a principal at Ignition partners, who joined the firm in 2016. She is passionate about working with and helping companies grow from seed or Series A. Her areas of interest include mobile enterprise apps, machine learning and software as a service(SaaS). Prior to Ignition, Preeti was at Opus Capital, where she invested in Turi (acquired by Apple) and Edunav. During her tenure at Juniper Ventures, Preeti invested in companies like Wickr (self-destructing messaging) and Vectra Networks (Advanced threat detection). 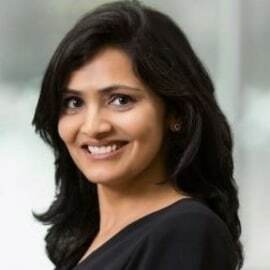 Preeti has a strong operating background where she held various roles in product management and development in Enterprise Edge, SDN, and Mobility. This included defining product strategy and roadmaps for $1B revenue products like the ASR 9000 Series. She has earned her Master’s Degree in Computer Science from Stanford University and her MBA from The Wharton School, University of Pennsylvania.